Be a part of a spectacular holiday tradition seen by 10,000 people each December! 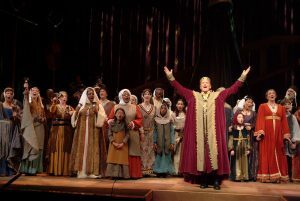 Washington Revels announces adult auditions for the 2019 Christmas Revels! Join our Adult Chorus and bring to life an exuberant blend of music, dances, and tales from across the centuries and around the world as we welcome Yule with DC audiences! Seen by 10,000 people each year, our 2019 production includes eight performances between December 7-15 at GW Lisner Auditorium in Washington, DC. Click below to read about our audition process, to learn how to schedule an audition, and to download the 2018 Adult/Teen Schedule (Audition Form coming soon).